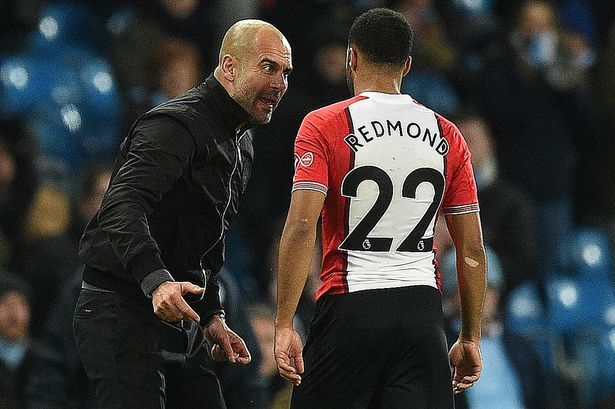 Pep Guardiola was involved in an intense conversation with Nathan Redmond following Manchester City’s dramatic 1- 0 win over Southampton on Wednesday night. Raheem Sterling scored a 96th-minute winner as the hosts continued their 12-match winning run. After the final whistle, Guardiola stormed over to Redmond, wrapped his arm around his neck and put his hands on his chest. The City boss then proceeded to have an animated discussion with the 23-year-old. During his post-match interview, Guardiola claimed he was telling Redmond that he was wasting time from the ninth minute. “I was telling Nathan Redmond how good he is at the end. Southampton have some super talented players, Redmond is so good one against one. “But they didn’t’ want to play, they were time wasting from the ninth minute. I just wanted them to play,” he said.